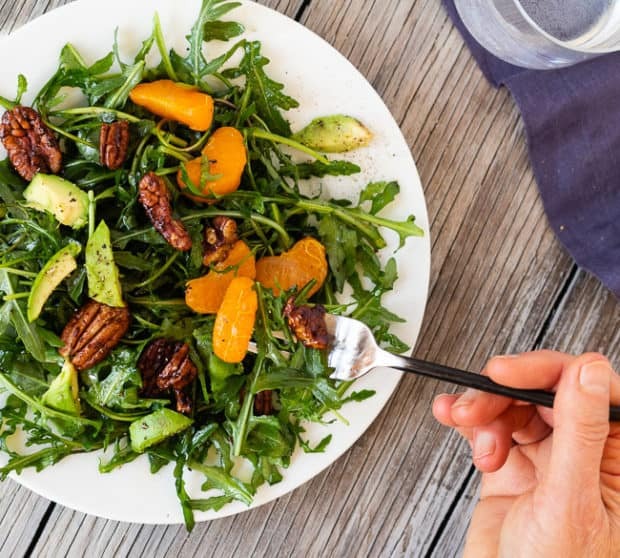 Bursting with color and flavor–bright citrus, ripe avocado, roasted pecans, and sherry vinaigrette, sweet, spicy, creamy, and crunch–you absolutely want this arugula salad with clementines and maple pepper pecans! As the weather gets hotter, we’re not much into turning the oven on for toasting a few nuts. No problem here–these caramelized crunchy peppery pecans are pan roasted, stovetop. Just stir the nuts around in a hot heavy-bottomed skillet with maple syrup, a bit of coconut oil, and plenty of freshly ground black pepper. They toast up beautifully! 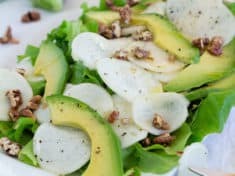 While the nuts cool into their crunchiness, whisk up a light tangy-sweet dressing out of sherry vinegar, maple syrup, a titch of Dijon mustard, and extra virgin olive oil. The sherry vinegar’s robust almost-caramel toasted nut flavor accents the peppery arugula, sweet mandarins, and oh—those pecans! 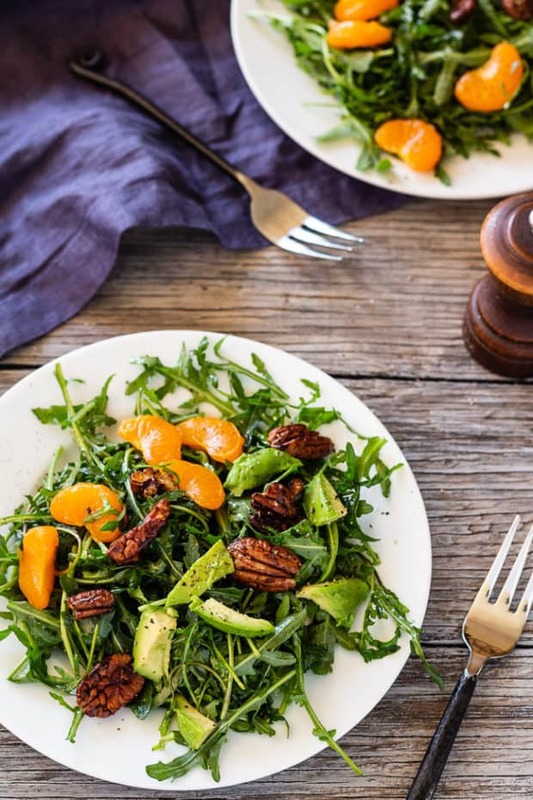 Click here to PIN Arugula Salad with Clementines and Maple Pepper Pecans! 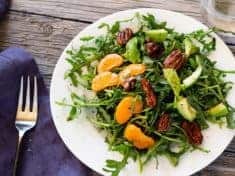 Grab the last of the spring season’s kid-sized oranges and add this amazing arugula salad with mandarin orange and maple pepper pecans to your salad repertoire! Mandarin oranges are slightly smaller hybrid cousins of the standard orange. Much in the same way gala and fuji are apple varietals, tangerines and clementines are varietals of the mandarin. From November into late spring, you can find kid-sized, easy-to-peel super sweet mandarins fresh—with brand names like Cuties, Halos, and Dimples. When mandarin oranges aren’t in season, simply substitute canned mandarin oranges. Strawberries are also delicious here, and pears. 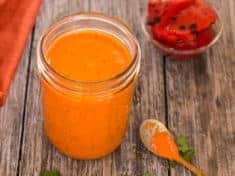 Made from fermented and aged Spanish wine, sherry vinegar gives this vinaigrette dressing its distinct pleasing taste. You’ll also love how sherry vinegar brings out the best in sautéed greens. In these chard quesadillas it’s the unbelieveable surprise ingredient! If your arugula comes from a garden or farm share box, it will likely be more peppery than baby arugula. 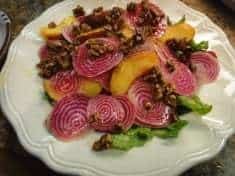 All the better for a vibrant salad! Do take the time to remove and discard the larger stems, and tear the leaves into smaller pieces. Make it a fabulous week–get in the kitchen and cook a light and delicious salad! Thanks for being here. To get my latest recipe posts and exclusive monthly newsletters, subscribe here. If you like this recipe, I’d be grateful if you’d give a ✮✮✮✮✮ rating on the recipe card below. For more vegetarian recipe ideas, peruse my Pinterest boards. Find daily vegetarian and healthy living ideas on my Facebook page. Follow me on Instagram! It’s my favorite! This post contains affiliate links. 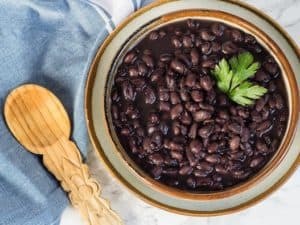 When you purchase products via my links, it doesn’t cost you anything and I earn a tiny commission, which helps me continue to provide free content here on Letty’s Kitchen. Thank you!! 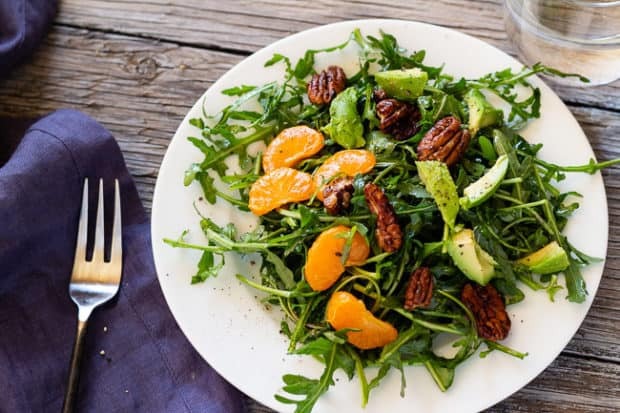 Peppery arugula with crunchy pecans, creamy avocado, and sweet mandarin oranges, all dressed with winning vinaigrette dressing--the ingredients in this salad dance together--for your eyes and taste buds. Serves about 4 people. Stir the pecans, maple syrup, coconut oil, salt, and pepper together in a heavy-bottomed skillet over medium heat. Stir continuously until the pecans are golden and the maple syrup has caramelized, 5 to 6 minutes. Remove from the heat, but continue to stir so the pecans don’t all clump together. Set aside to cool. Whisk the vinegar, mustard, garlic, maple syrup, salt, and pepper together. Continue whisking while drizzling in the olive oil. Toss the arugula in a bowl with a few tablespoons of vinaigrette. Mix another tablespoon with the clementine segments so they are shiny, and then mix them with the arugula, adding more vinaigrette if you think it’s needed. 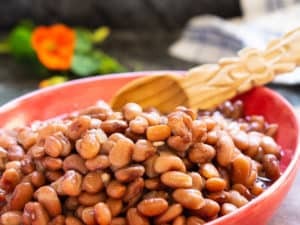 Arrange in a bowl or on individual plates. Top with the maple pepper pecans and avocado. Finish with several grinds of black pepper. Makes more vinaigrette than you will likely use for this salad. Midsummer, when mandarin oranges aren’t in season, substitute canned mandarin oranges. If you have arugula from your garden or farm share box, remove and discard the stems and tear the larger leaves into smaller (1 ½-inch) pieces.